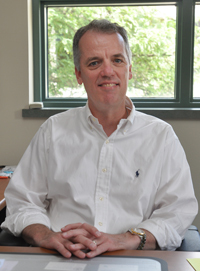 Tom Curran, MD is an Associate Professor of Bioethics and Humanities. Dr. Curran joined the Center in 2008. He received his medical degree from Georgetown University. Dr. Curran teaches in several venues at Upstate Medical University. He is the Clerkship Director for the third-year medical student course, Clinical Bioethics, in the College of Medicine; lecturer for nurse residency; co-facilitator for medical education's Journal Club; and small group instructor and lecturer of the course, Patients to Populations: Ethics, Law, and Public Health, a required course for first-year medical students. His research interests include neonatal ethics and medical student education. Dr. Curran is active in the community, serving as Physician Chair of the Crouse Hospital Pediatric Quality Improvement Council, and member of the Crouse Hospital Foundation Board. He is also a fellow of the American Academy for Pediatrics, section of Neonatal-Perinatal Medicine. Dr. Curran directs the Upstate Ethics Consultation Service. He may be reached by phoning 315.464.8457 or by email at currant@upstate.edu. Last Modified: August 28, 2018. Contact Jessica Barbuto with questions about the content of this page.